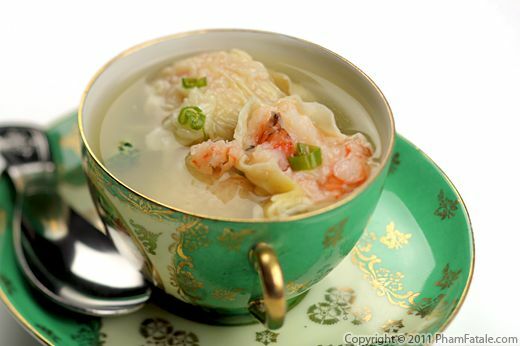 Shrimp wonton soup is a delicious soup made with dumplings and chicken broth. It's perfect for soothing your throat. I served the Asian shrimp wontons along with broccoli florets to keep the dish very simple. 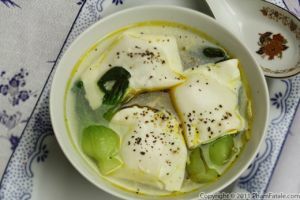 If you want to serve this soup as a main course, you could add egg noodles along with other greens such as bok choy. We're finally back from Texas where we spent our spring break and everyone except me is starting to get sick. 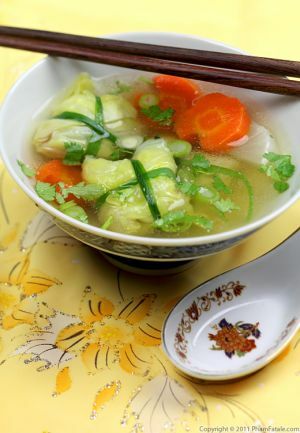 I made this soup for the meat eaters in the house, but a vegetarian wonton soup is just as easy to prepare. Seasoning the broth: Bring the chicken broth and 2 cups water to a boil in a pot. Add the rock sugar and caramelized onions. Lower the heat to medium-low and cook for about 15 minutes. Set the heat on low while preparing the shrimp wontons. Adjust seasoning with mushroom seasoning salt (or regular salt) and pepper. For the shrimp balls: In a bowl, season the shrimp with 1 teaspoon of fried garlic, salt, red chili powder and black pepper. Reserve about 3 ounces of the shrimp that you cut into thirds. In a food processor or a mini-blender if you have one, blend the rest of the shrimp with the baby squid and about 2 teaspoons of the canola oil. Transfer to a bowl. Add the cut shrimp. Mix well. How to wrap wontons (this is one method; there are a million other ways of forming these dumplings): Brush each side of a wonton square with a little water. 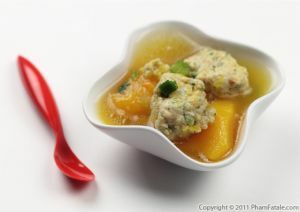 Spoon about 1-½-tablespoon-sized shrimp balls in the center of the wonton square. Gather the wonton wrap into a purse. Press firmly at the tip. Repeat until all the shrimp is used. Assembly time: In an individual serving bowl, add a teaspoon of green onions and cilantro. Fill another small pot with salted water. Bring to a boil, then add the chopped broccoli florets. Place about 5 wontons at a time in the pot. Cook for about 4-5 minutes until the wonton skin is cooked. 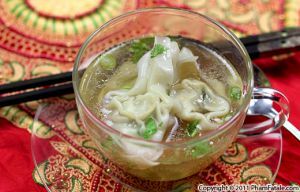 Drain the wontons using a slotted spoon and immediately transfer to the bowl. Count about 8 wontons per person. Repeat with the rest of the bowls. When you're ready to serve, bring the chicken stock to a roaring boil one more time. Add black pepper. Cover the wontons with the hot liquid. Serve hot. Garnish with cilantro. Drizzle nước mắm over the broth to finish (to adjust the seasoning if you like). To seal each dumpling, you could brush a little lightly beaten egg whites on the wonton wrap instead of just water. You can find wonton wraps in the fresh section of Asian stores. I buy mine at Ranch 99 market. My favorite brand is New Hong Kong Noodle Company (this same brand is also excellent for thin egg noodles). I buy dried crispy fried garlic at the Asian store. It's sold in 14-ounce containers. It's crunchy and very strong in flavor. You can also make your own if you like, by frying small chunks of fresh garlic. 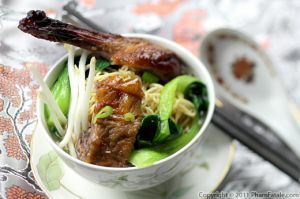 The addition of fried onions into the broth prevents the soup from being tanh ("fishy") when the shrimp is added. It's a trick when cooking seafood or meat in broth. Published By: Jacqueline Pham on April 22, 2011.